Samuel Lum lost a loved one to a serious infection that stemmed from a catheter. The loss encouraged him to gather together a student research team dedicated to developing an enzyme that would prevent bacteria growth inside the medical devices. 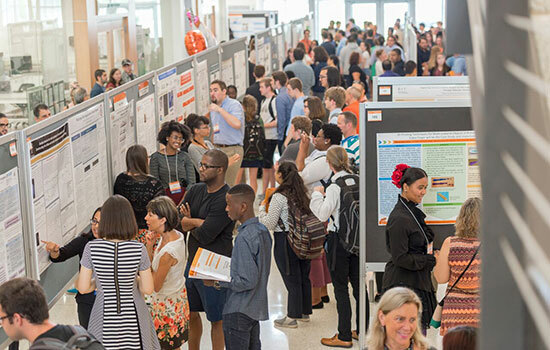 His project, “The Catheter Solution,” was among more than 250 student projects, representing all nine colleges, on display at the 27th annual Undergraduate Research Symposium on Aug. 3 at RIT. Research proposals were featured in a series of oral and poster presentations throughout the day. The event, which took place in Louise M. Slaughter Hall and Sustainability Institute Hall, is structured as a professional research conference. Some of the research themes included biomedical and life sciences; optics, photonics and imaging; energy and sustainability; business; chemistry and materials sciences and engineering; computer modeling, design and simulation; ecology; and social sciences and humanities. "This event represents the culmination of hard work and thoughtful discussions with their research advisors," said Michael Coleman, associate professor of chemistry and symposium chairperson. 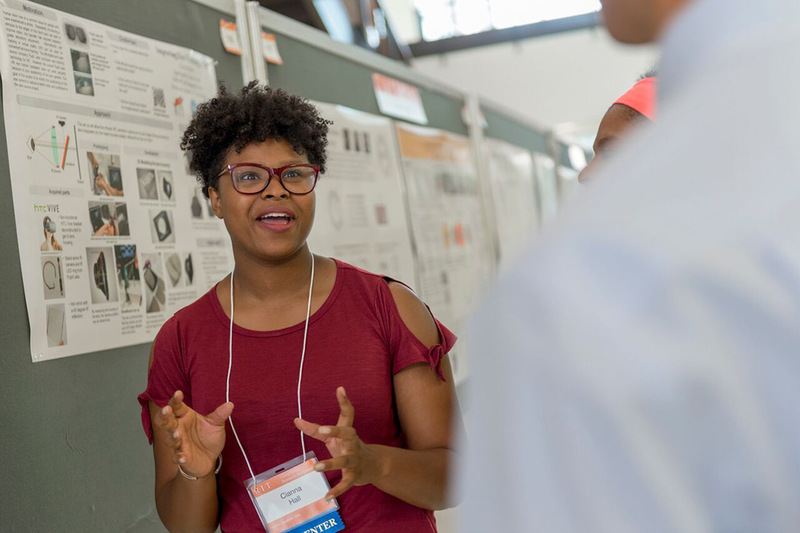 "It is a unique opportunity for these aspiring scientists to present their research interests to the diverse and supportive RIT scientific community." Joshua Faber, associate professor of mathematical sciences in RIT’s College of Science, sees his role as a research adviser as steering his undergraduate students toward research where they can use their existing skills, teaching them new things that will aid them as they develop as scientists, and trying to broaden their horizons as to what science is and how they can make continuing contributions to it. 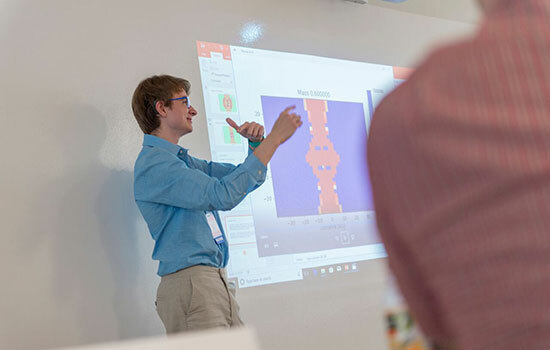 This year’s presentations featured a gamut of far-reaching innovations—from researching supermassive black holes, to the impact of wetlands on greenhouse gases, to the effects of leaderships styles on motivation. Lum, a fifth-year mechanical engineering technology major/cellular biology minor from New York, N.Y., said that leading his research group as an undergraduate student is the biggest undertaking of his life so far. He is proud of his team that has worked tirelessly throughout the summer, and he’s excited to be able to continue what they’ve started. Lum plans to be a visiting scholar at Johns Hopkins University next semester. Ryan Pluck, a fourth-year psychology student in the College of Liberal Arts, is studying visual perception in animals and how North American river otters process shapes above and below water. For the past few months, he has been part of the Summer Undergraduate Research Fellowship program. His grant-funded work with otters Heather and Sailor from Rochester’s Seneca Park Zoo will ultimately help determine how they identify food and predators and will enhance otter conservation efforts and the understanding of otter ecosystems. 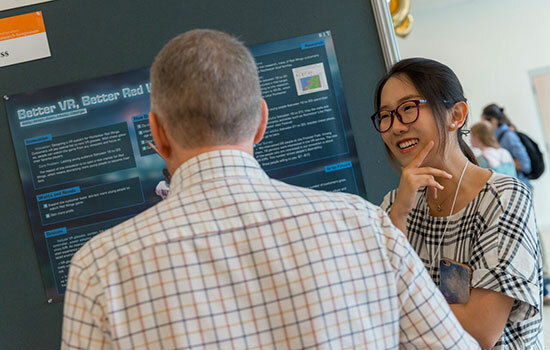 As part of their Saunders College of Business poster submission, Yu Lu and Yulin Bian, Chinese students majoring in marketing from Beijing Jiaotong University, researched the use of virtual reality at Rochester Red Wings games. The keynote speaker for the symposium was Stephen Polly ’09 ’15 (microelectronic engineering, microsystems engineering), a research scientist in RIT’s NanoPower Research Laboratory. The symposium is sponsored by RIT’s Office of the Vice President for Research.